If you are what you eat, researchers have found a rapid way to determine what you’re eating, if it contains fat. 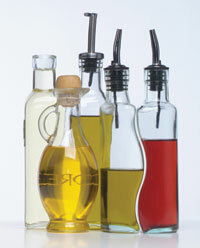 They have reduced the time it takes to characterize edible oils from several days to five minutes. This will help industrial food chemists and importers increase efficiency and reduce costs, which may one day lead to savings for consumers. Jackson O. Lay Jr., director, and Rohana Liyanage of the Mass Spectrometry Facility and Bill Durham, professor of chemistry, reported their findings in Rapid Communications in Mass Spectrometry. “It’s important to characterize fats so that people know what they’re eating,” Lay said. Traditional methods of measuring the components of edible oils involve breaking down the fats – diglycerides and triglycerides into glycerol and free fatty acids – a process called saponification, which is also used to make soap. This process is time-consuming and transforms the original oil into a different product, one in which the diglycerides and triglycerides can’t be distinguished. “For years, people assumed that it didn’t matter, but it turns out that it matters a great deal,” Lay said. The two types of fat are metabolized differently, and diglycerides may be beneficial to human health. So the ratio of diglycerides to triglycerides may interest nutrition researchers. The scientists used matrix-assisted laser desorption/ionization mass spectrometry, or MALDI-MS, as a direct method of characterizing oils. They measured the spectra of the oils to determine the mass of the different components of the oil and sorted out fatty acids of different weights. The researchers purchased soybean oil, sunflower oil, corn oil, canola oil, olive oil, peanut oil, hydrogenated vegetable oil, shortening, butter and lard. When they compared the results of MALDI-MS to other characterization methods, they found agreement within 4 percent of research literature values and within 7 percent of values on package labels, which could be due to rounding in nutritional labels.